The Pembrokeshire Coast National Park, Wales, is an area of outstanding natural beauty ideally suited for both wildlife and landscape photography. Over the course of this workshop we will visit a selection of the prime locations the region has to offer, including the world renown Skomer Island, so you can enjoy an opportunity for some exciting and rewarding outdoor photography. 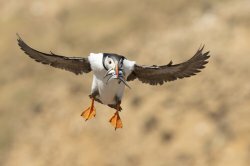 Skomer Island National Nature Reserve is home to a plethora of sea bird colonies, which will be of particular interest, especially the iconic Puffin, as the workshop has been timed to coincide with them coming ashore carrying sandeels to feed their young. Other bird species you will be able to observe and photograph include, Razorbill, Guillemot, Kittywake, Fulmar, and Gannet. 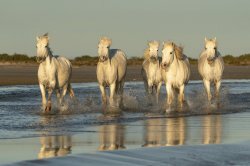 The thrill of photographing the world renown Wild White Horses of the Camargue running through the shallow waters of the marshes, and galloping in the surf of the Mediterranean Sea is a dream come true for any photographer passionate about wildlife; however, the excitement does not stop there, as in addition to a variety of shoots with the horses you will also photograph a herd of imposing Black Camargue Bulls being driven by a team of Gardians and stunning Camargue birdlife, including flocks of Pink Flamingos as they take flight in formation at sunrise.